Corn silage and grain yields have steadily increased since World War II (Figure 1) with a slightly greater increase per year for corn grain than for corn silage, possibly reflecting an emphasis on corn grain improvement by plant breeders in the past decades. Figure 1: New York State average corn silage and grain yields over time show a steady increase 1948 – 2015 in both silage and grain yields but also large year-to-year variation. 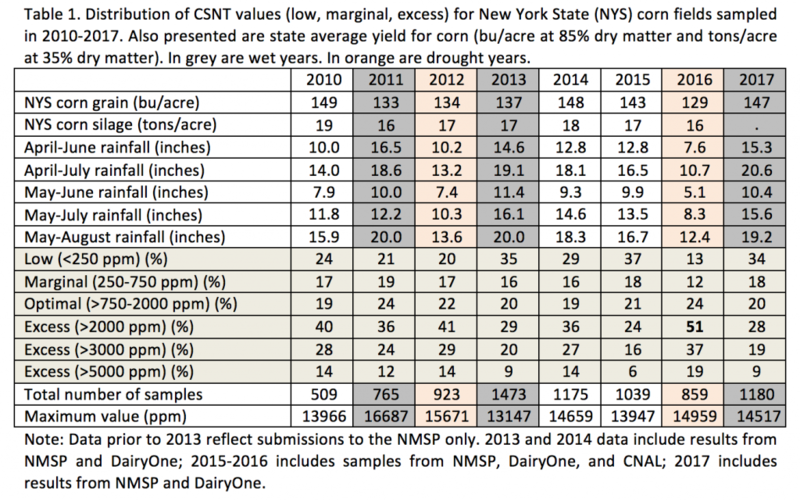 Yield data source: New York State Agricultural Statistics Service. With an increase in yield comes the question: has the ability of improved crop varieties to explore the soil for nutrients kept up with higher yield or do we need to supply more N fertilizer to meet N needs? Further, we need to look at what differences in field traits (within and between) affect yield beyond the hybrid selected and the N fertilizer or manure that was applied. Nationwide evaluation of N use shows that overall, farmers are using the same average fertilizer N rates even while yields have been increasing. Does that hold true for New York? With increasing focus on the water and air quality impacts of nutrient losses from agriculture, combined with higher risk of loss when nutrient applications are in excess of plant need, these questions are more important than ever for the future of agriculture in New York. 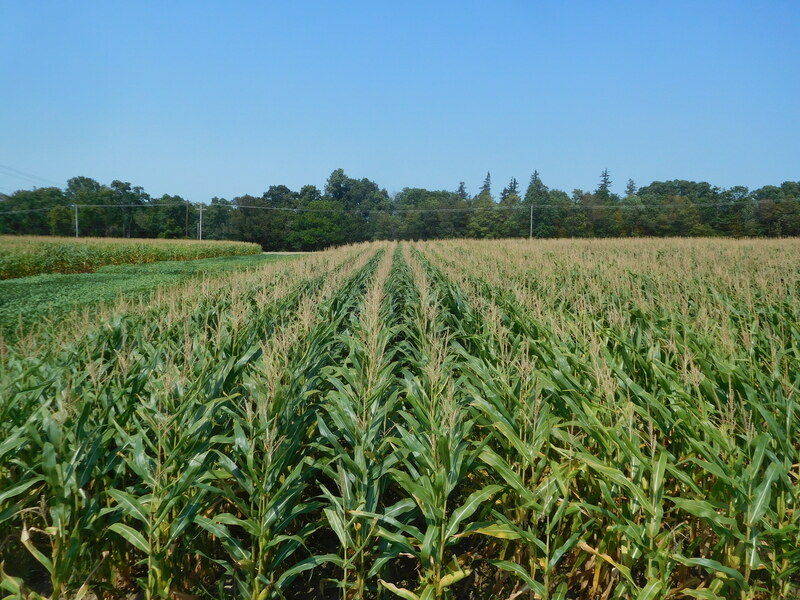 Before we can answer these questions, we need to know the actual yield levels for corn grown for grain and also for corn grown and harvested for silage. We also need to know how stable yields are from year to year as fields that deliver stable yield results will likely require different management from fields that yield low one year and high the next, depending on the growing season. With a growing number of choppers joining the fleet of combines with yield monitors we now have the opportunity to summarize large yield datasets to help update several important issues: these include the ability to generate an updated general yield potential database, the opportunity for farms to develop and maintain their own yield potential database, and the ability to more quickly test if higher yielding fields, zones within fields, or specific varieties need higher N applications to meet or exceed potentials. 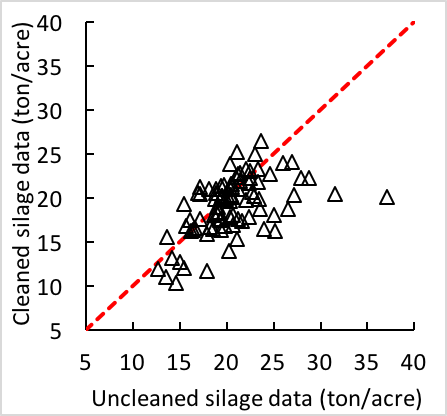 Figure 2: A consistent data cleaning process is essential for creation of reliable multi-field and multi-year yield maps. The first requirement when working with yield monitors, is to make sure they are calibrated regularly. However, even with well-calibrated equipment, yield data from monitors need to be combed for obvious errors through a cleaning process, especially for silage yield monitors (Figure 2). To ensure we use the best possible data, cleaning protocols were developed recently for both grain and silage that now allow for fairly quick checking and cleaning of data for all corn grain and silage yield data in a particular harvest year. A manual that will help producers or consulting companies do this will be released in early 2018. With this new data cleaning process, the Nutrient Management Spear Program in partnership with farmers and consulting firms, is now analyzing data from test farms located in Northern New York through a grant supported by the Northern New York Agriculture Development Program. The hope is to expand this beyond the farmers currently involved and thus create a statewide database for corn grain yield and for corn silage yields per soil type in the coming years. Once data are cleaned, we can create yield frequency histograms (Figure 3). 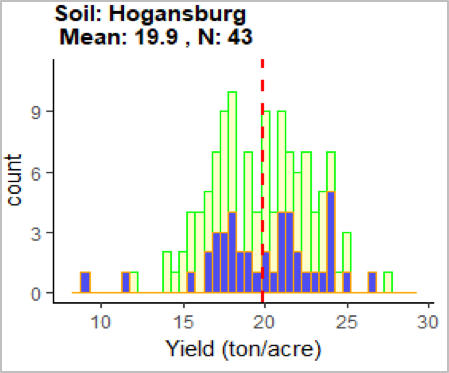 Figure 3: Histogram of yields of Hogansburg soils (N=43) in northern New York. Blue are fields harvested in the year of reporting. In green are all fields of this soil type harvested and recorded to date, previous years included. These types of histograms show the range of yields and how many fields with this soil type provided a certain yield. For example, in the case of 43 fields with the Hogansburg soil shown in Figure 3, the average yield was 19.9 tons/acre while 5 fields out of 43 yielded more than 25 tons/acre and one field averaged 27.5 tons/acre (maximum reported for the example shown in Figure 3). These histograms allow for determination of means, medians, ranges in yields, etc. and they can help us (1) quickly update the yield potential database for corn grain that is the foundation for the basic N guidelines; and (2) develop an independent database for yield potentials for corn grown for silage. Stay tuned for further updates! A call for participating will be shared with farmers and farm advisors as funding to proceed at a larger scale is granted. The protocols for data sharing are available through the NMSP website (http://nmsp.cals.cornell.edu/NYOnFarmResearchPartnership/YieldDatabase.html). The data-processing protocol will be added to this page once completed. We thank the farmers and farm consultants that have participated in the yield potential evaluation project to date. For questions about these results contact Quirine M. Ketterings at 607-255-3061 or qmk2@cornell.edu, and/or visit the Cornell Nutrient Management Spear Program website at: http://nmsp.cals.cornell.edu/. The corn stalk nitrate test (CSNT) allows for evaluation and fine-tuning of N management for individual fields over time. 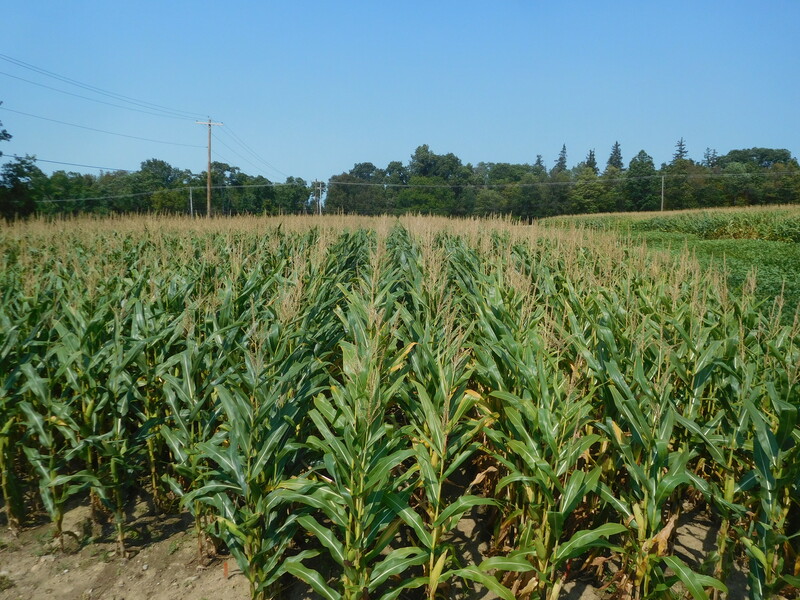 It is an end-of-season evaluation tool for N management for 2nd or higher year corn fields that allows for identification of situations where more N was available during the growing season than the crop needed. Where CSNT results exceed 3000 ppm for two or more years, it is highly likely that N management changes can be made without impacting yield. The summary of CSNT results for the past eight years is shown in Table 1. For 2017, 28% of all tested fields had CSNTs greater than 2000 ppm, while 19% were over 3000 ppm and 9% exceeded 5000 ppm. In contrast, 34% of the 2017 samples tested low in CSNT. As crop history, manure history, other N inputs, soil type, and growing conditions all impact CSNT results, conclusions about future N management should take into account the events of the growing season. In addition, weed pressure, disease pressure, lack of moisture in the root zone in drought years, lack of oxygen in the root zone due to excessive rain (anaerobic soil conditions), and other stress factors can impact the N status of the crop as well. The 2017 data are consistent with 2013, another extremely wet year with 20 inches of rainfall between May and August. These data highlight the need to evaluate CSNT results in light of not only manure and fertilizer N management but also weather patterns that year. They also show the importance of multiple years of results to gain experience with on-farm interpretation. Within-field spatial variability can be considerable in New York, requiring (1) high density sampling (equivalent of 1 stalk per acre at a minimum) for accurate assessment of whole fields, or (2) targeted sampling based on yield zones, elevations, or soil management units. Work is ongoing to evaluate targeted sampling that is expected to significantly reduce time commitment to taking CSNTs. Two years of CSNT data are recommended before making any management changes unless CSNT’s exceed 5000 ppm (in which case one year of data is sufficient). Figure 1: In drought years (2012 and 2016), more samples test excessive in CSNT-N while fewer test low or marginal. This is consistent with reduced yields in drought years: state average corn yields were 132 bu/acre in the drought years of 2012 and 2016 versus an average of 147 bu/acre in years with a more normal precipitation (2010, 2014, and 2015). In excessively wet years (2011, 2013, and 2017) the average yield was 139 bu/acre but ranged from 135 bu/acre (average of 2011 and 2013) to 147 bu/acre in 2017. The highest CSNT-N level obtained in 2017 was a little over 14500 ppm, similar to the average of maximum values over the last eight years which is just shy of 14700 ppm. Instructions for CSNT Sampling; Cornell Nutrient Management Spear Program: http://nmsp.cals.cornell.edu/projects/nitrogenforcorn/StalkNtest.pdf. 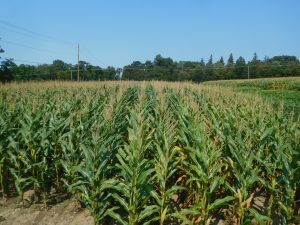 Agronomy Factsheets #31: Corn Stalk Nitrate Test (CSNT); #63: Fine-Tuning Nitrogen Management for Corn; and #72: Taking a Corn Stalk Nitrate Test Sample after Corn Silage Harvest. http://nmsp.cals.cornell.edu/guidelines/factsheets.html. We thank the many farmers and farm consultants that sampled their fields for CSNT. For questions about these results contact Quirine M. Ketterings at 607-255-3061 or qmk2@cornell.edu, and/or visit the Cornell Nutrient Management Spear Program website at: http://nmsp.cals.cornell.edu/. Organic wheat on the right (two 10-foot passes) was planted at 1.2 M seeds/acre, the same rate as the conventional wheat in the left. The variety is the same (P25R46) in both cropping systems but the conventional wheat on the left received a fungicide-insecticide seed treatment, whereas the organic wheat on the right received no seed treatment. We initiated a 3-year study at the Aurora Research Farm in 2015 to compare different sequences of the corn, soybean, and wheat/red clover rotation in conventional and organic cropping systems under recommended and high input management during the 36-month transition period (2014-2017) from conventional to an organic cropping system. This article will focus on days to emergence, early plant densities, and fall weed densities of wheat in the fall of 2017. Soybeans were harvested on September 26. We no-tilled wheat into the soybean stubble on the following day, September 27, because of the paucity of winter annual and winter perennial weeds. We used a John Deere 1590 No-Till Grain Drill to plant the treated (insecticide/fungicide seed treatment) soft red wheat variety, Pioneer 25R46, in the conventional cropping system; and the untreated 25R46 in the organic cropping system at two seeding rates, ~1.2 million seeds/acre (recommended input) and ~1.7 million seeds/acre (high input treatment). Soil conditions were dry so we planted ~2.0 inches deep to get into moisture. We applied about 200 lbs. /acre of 10-20-20 as a starter fertilizer to conventional wheat in both input treatments. In the organic cropping system, we applied the maximum amount of Kreher’s composted manure (5-4-3 analysis) that would flow through the drill, or about 100 lbs. of material/acre, as a starter fertilizer in both organic input treatments. We also broadcast Kreher’s composted manure to provide ~60 lbs. of actual N /acre (assuming 50% available N from the composted manure) in the high input treatment in the organic cropping system. In addition, we also added Sabrex, an organic seed treatment with Tricoderma strains, to the seed hopper of 25R46 in the high input treatment in the organic cropping system. Finally, we also applied Harmony Extra (~0.75 oz. /acre) to the high input conventional treatment at the early tillering stage (GS 2-October 27) for control of winter perennials (dandelion in particular). We estimated plant emergence (>50% emergence) on October 6 and 7. We estimated plant densities on October 13 by counting all the plants in the four middle rows along a 1-m long meter stick in five different regions in the 100 foot long plots. We estimated weed densities on October 28 by counting all the visible winter weeds (there were a few summer annuals but numbers were low) along the entire 100 foot plot in the immediate 8 rows (on the way up) and the more distant 8 rows (on the way back). We also noted the dominant weeds in the plots (95% or more of the winter weeds were dandelions). Organic compared to conventional wheat emerged 1.0 to 1.75 days earlier, had much better stands 2 weeks after planting, and fewer weeds 5 weeks after planting (Table 1), similar to our 2015 results (http://blogs.cornell.edu/whatscroppingup/2015/11/23/wheat-emergence-early-plant-populations-and-weed-densities-following-soybeans-in-conventional-and-organic-cropping-systems/). The experimental site received only 1.48 inches of precipitation in August and 2.55 inches in September so soil conditions were generally dry after soybean harvest. More specific to planting time, only 0.18 inches of precipitation were recorded in the 10-day period before planting to the 10-day period after planting. Dry soil conditions, the 2-inch planting depth, and the considerable soybean stubble (55-60 bushel/acre crop) undoubtedly contributed to the relatively long emergence time (8 to 10 days), despite warm conditions for the 8 to 10 days after planting (58.6 vs. 55.7 OF, average since 1980). As in 2015 wheat, we speculate that the seed treatment in the conventional wheat made the seed somewhat more impermeable to soil water imbibition under the relatively dry soil conditions, resulting in delayed emergence in the conventional cropping system by 1 to 1.75 days. We also noted more rapid emergence for organic compared with conventional corn in 2016 under very dry soil conditions. 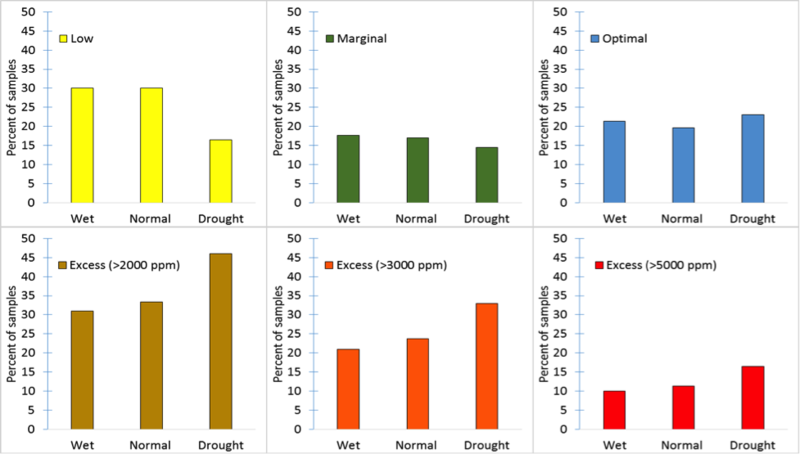 It would be interesting to test if seed treatment actually delays emergence of crops under dry soil conditions because of the consistency of observations across crops and dry years at planting in our study. Organic compared to conventional wheat had greater plant densities (37%) 2 weeks after planting in part because of the delayed emergence of conventional wheat (Table 1). More conventional wheat emerged after our observations but we could not do another wheat density count because the earlier emerging wheat began to initiate tillers, which made counting too problematic. Another factor that may have influenced our results is that seed size differed between the untreated 25R46 (~11,000 seeds/lb.) and the treated 25R46 (~12,000 seeds/lb.) so drill settings were not consistent between the two plantings. Organic compared with conventional wheat also had 10 to 25% greater early plant densities 2 weeks after planting in the fall of 2016. Organic and conventional wheat, however, had a similar number of spikes or heads/m2 at harvest (~525 heads/m2) in 2016 so conventional wheat compensated for the lower plant densities with increased tillering, contributing in part to its 7.5% greater yield (http://blogs.cornell.edu/whatscroppingup/2016/09/26/organic-wheat-looked-great-but-yielded-7-5-less-than-conventional-wheat-in-20152016/). 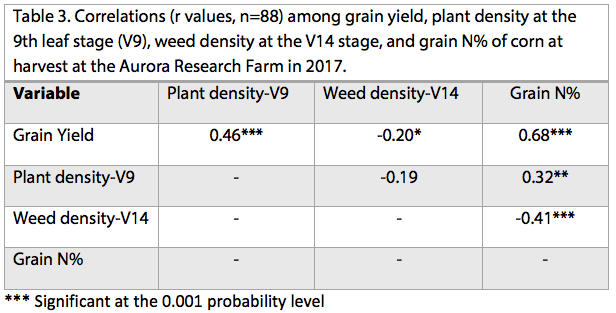 Once again, organic compared with conventional wheat generally had fewer weed densities, especially in the field in which corn was the 2014 crop (Table 1). Weed densities, however, were very low so yields will probably not be compromised except in a couple of the plots in the conventional cropping system under recommended inputs (no herbicide) when corn was the 2014 crop. Dandelion was the dominant weed specie in all plots. Apparently, the last cultivation of soybean on July 20 removed existing or late-emerging dandelions, whereas the observed weeds in the conventional cropping system apparently emerged after the June 21 Roundup application. In conclusion, organic compared with conventional wheat, no-tilled into soybean stubble, once again got off to a better start in the fall of 2017, as it did in the fall of 2015. Despite the better fall start in 2015, organic wheat yielded 7.5% lower. We could only apply ~100 lbs. /acre of Kreher’s compost to the organic wheat through the drill at planting in both years, due to flow problems of the composted manure, which may be a yield constraint (very little P or K applied). We will top-dress the recommended input treatment with ~75 lbs. N/acre of Kreher’s material at green-up time in the early spring, and add an additional ~50 lbs. of N/acre with Kreher’s to the high input treatment at the end of tillering, as we did in the spring of 2016. The organic wheat, however, had much lower kernel N (1.66% N) compared with conventional wheat (2.03% N) at harvest in 2016, indicating that lack of available soil N in organic wheat probably contributed to the 7.5% lower yield in 2016. Wheat fertility and not stand establishment nor weed control appears to be the major challenge to successful organic wheat production under conditions in our study. Conventional corn on the left received 140 lbs. N/acre and the corn ion the right received 90 lbs. N/acre side-dressed. Usually 90 lbs. N/acre side-dressed + 25 lbs. N/acre in the starter suffices for corn following soybean but not in 2017, as indicated by the firing of the leaves, when ~10 inches of precipitation occurred from side-dressing until a week after silking (July 27). 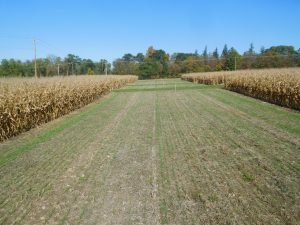 We initiated a 4-year study at the Aurora Research Farm in 2015 to compare different sequences of the corn, soybean, and wheat/red clover rotation in conventional and organic cropping systems under recommended and high input management during the 36-month transition period from conventional to an organic cropping system. We provided a detailed discussion of the various treatments and objectives of the study in a previous news article at the onset of the study (http://blogs.cornell.edu/whatscroppingup/2015/07/23/emergence-early-v4-stage-and-final-plant-populations-v10-psnt-values-v4-and-weed-densities-v12-in-corn-under-conventional-and-organic-cropping-systems/). Unfortunately, we were unable to plant wheat after soybean in the fall of 2016 because green stem in soybean, compounded with very wet conditions in October and early November, delayed soybean harvest until November 9, too late for wheat planting. 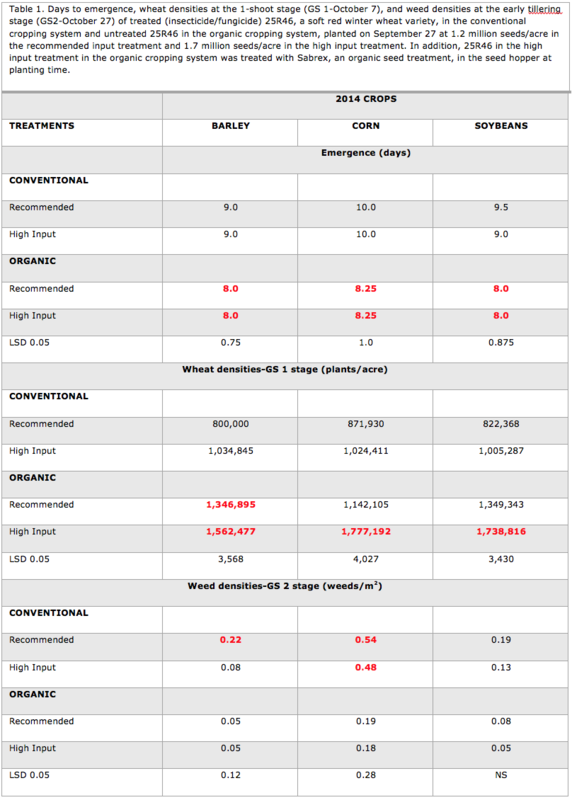 Consequently, corn followed soybean as well as wheat/red cover in 2017 so we are now comparing different sequences of the corn-soybean-wheat/red clover rotation with a corn-soybean rotation (Table 1). This article will focus on corn yields while also providing supporting plant density, weed density, and grain N data. Organic corn on the right received an additional 50 lbs. N/acre as composted manure before plowing and the organic corn on the left did not. Evidently, the plowed-down clover provided some (as indicated by its 18 bushel/acre higher yield than conventional corn with recommended inputs) but not enough as indicated by the firing of some of its leaves and its 26 bushel/acre lower yield than the high input treatment. The red clover green manure crop (~2.5 dry matter tons/acre and ~3.85% N in the organic plots but only 1.25 tons/acre and ~3.0% N in conventional plots), which was inter-seeded into the 2016 wheat crop, was mowed on May 16. Organic corn in the high input treatment following wheat/red clover received a broadcast application before plowing of ~50 lbs. N/acre of Kreher’s composted manure (5-4-3) but none in the recommended input treatment; and ~100 lbs. N/acre in the recommended input and ~140 lbs. N/acre in the high input treatment following soybean. The fields were plowed on May 17, then cultimulched on the morning of May 18, the day of planting. We planted a treated (insecticide/fungicide seed treatment) GMO corn hybrid, P96AMXT, in the conventional system; and its isoline, the untreated non-GMO, P9675, in the organic cropping system at two seeding rates, ~29,600 kernels/acre (recommended input treatment) and 35,500 kernels/acre (high input). The high input organic treatment also received the organic seed treatment (in-hopper), Sabrex. Conventional corn received ~250 lbs. /acre of 10-20-20 as starter fertilizer, whereas organic corn received about ~315 lbs. /acre of Kreher’s composted manure through the planter. Conventional corn was side-dressed on June 15 (V3-4 stage) with ~50 lbs. N /acre in the recommended input and ~90 lbs. N /acre in the high input treatment following wheat/red clover; and ~90 lbs. N/acre in the recommended input and ~140 lbs. N/acre in the high input treatment following soybean. We applied Roundup (Helosate Plus Advanced) for weed control in conventional corn (V4-V5 stages) under both recommended and high input treatments. We used the rotary hoe to control weeds in the row in recommended and high input organic corn at the V1-2 stage (June 2). We then cultivated close to the corn row in both recommended and high input organic treatments at the V3 stage (June 12) with repeated cultivations between the rows at the V4-V5 stage (June 22), the V5-V6 stage (June 28), and the V7-8 stage (July 5). We estimated corn densities at the V1-2 stage by counting all the plants along the 100 foot plot in the two middle harvest rows, just hours before the rotary hoeing operation. We then estimated corn densities again at the V3 stage, 10 days after rotary hoeing but before the first cultivation; and again at the V9 stage after completion of all in-row cultivations. We will provide just the V9 data in this article because we already provided corn density data at all three growth stages in a previous article (http://blogs.cornell.edu/whatscroppingup/2017/07/26/close-cultivation-followed-by-three-in-row-cultivations-reduce-organic-corn-plant-densities-by-another-3-5-or-1000-plantsacre/). We estimated weed densities (greater than ~2 inches in size) at the V14 stage (July 20) by counting all the weeds along the 100 foot plot between the two harvest rows. We harvested corn with an Almaco Plot Combine on October 19, when grain moistures were in the 17-19% range. We collected ~1000 gram samples from each plot to determine grain moisture, test weight, and grain N.
Organic corn had 9% lower plant densities compared with conventional corn at the V9 stage (Table 2). As mentioned in previous articles, plant densities were similar between organic and conventional corn 12 days after planting (http://blogs.cornell.edu/whatscroppingup/2017/06/05/organic-and-conventional-corn-have-similar-emergence-and-early-plant-densities-in-2017/). 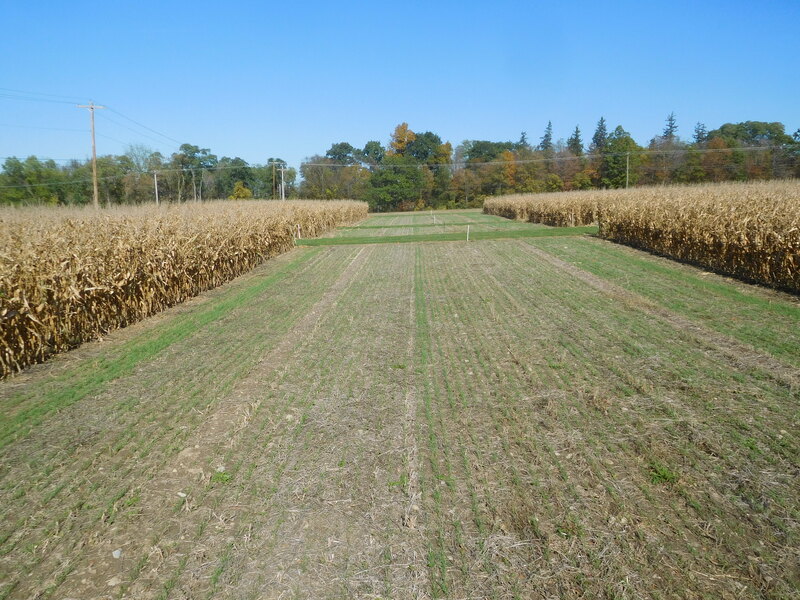 The rotary hoeing operation, however, reduced plant densities in organic corn by 5.5%, and the repeated cultivations, including the close cultivation at the V3 stage, reduced plant populations an additional 3.5% (http://blogs.cornell.edu/whatscroppingup/2017/07/06/rotary-hoe-operation-at-the-v1-2-stage-decreases-organic-corn-plant-densities-by-5-5-but-has-limited-effect-on-organic-soybean-plant-densities/). 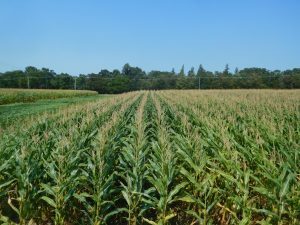 Consequently, the recommended treatment in organic corn had final plant densities of only 22,000-24,000 plants/acre, too low for optimum yields on most soils in New York. The repeated cultivations in organic corn provided satisfactory to excellent weed control, depending upon the previous crop in 2016 (Table 2). As mentioned in a previous article (http://blogs.cornell.edu/whatscroppingup/2017/08/10/wheatred-clover-provides-n-and-may-help-with-weed-control-in-the-organic-corn-soybean-wheatred-clover-rotation/), weed densities in organic corn following the 2016 wheat/red clover crops were similar or lower compared with conventional corn. Weed densities in organic corn when following soybean in the rotation, however, were consistently greater than weed densities in conventional corn or organic corn following wheat/red clover. As mentioned in the previous article, it is not completely clear why weed densities were so much lower in organic corn following wheat/red clover compared with following soybean (separated only by a 10 foot border row) across all three fields with different 2014 previous crops. Corn yield showed a cropping system x input treatment interaction (Table 2). In a true shocker, organic compared with conventional corn with high inputs following wheat/red clover yielded a stunning 31 bushels/acre greater (206 bushels/acre vs. 175 bushels/acre average yields, respectively, Table 2). ). As mentioned in the weed control article, organic corn with high inputs following wheat/red clover was poised to yield as well as conventional corn in 2017 because final stands averaged ~28,500 plants/acre, pre-sidedress nitrogen (PSNT) values averaged ~30 ppm, and weed densities averaged only ~0.55 weeds/m2. We did not expect it to yield 18% higher, however. What happened? We mentioned that red clover, frost-seeded into organic winter wheat in early March of 2016, averaged 2.25 tons/acre of dry matter with 3.85% N compared with only 1.25 dry matter tons/acre with a 3.0% N concentration in conventional wheat. For some unknown reason, the ammonium nitrate applied to conventional wheat in April of 2016 resulted in poor red clover growth. Consequently, we side-dressed 50 lbs. N/acre to the recommended conventional treatment and 90 lbs. N/acre to the high input conventional corn treatment following wheat/red clover (instead of the intended 0 and 50 lbs. N/acre, respectively). Nevertheless, conventional corn following wheat/red clover in the recommended treatment (50 lbs. N/acre) yielded an average 18 bushels/acre lower than the recommended organic corn treatment, which received no additional N and relied totally on plowed in red clover for its N supply. Apparently, the red clover crop provided essentially zero N to conventional corn as indicated by the 14 bushel /acre increase in the high input treatment, which received 50 lbs./N/acre side-dressed. Conventional corn following soybean, which received 90 and 140 lbs. 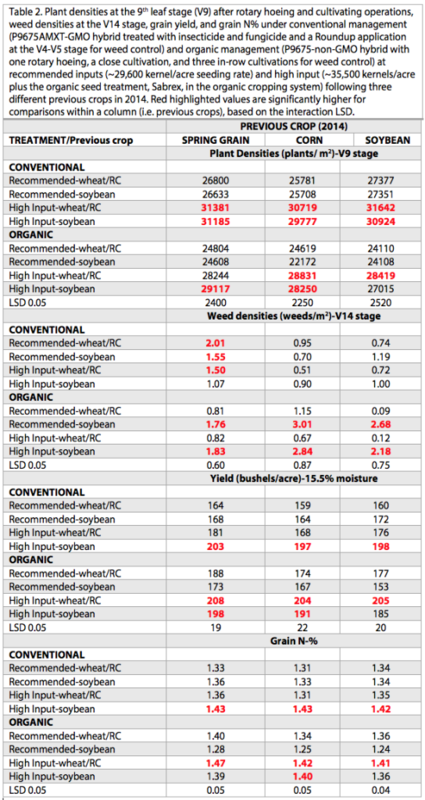 N/acre sided-dress N, compared with organic corn following soybean, which received comparable organic N rates, yielded similarly (numerically higher) in both the high and recommended input treatments (Table 2). Both organic corn and conventional corn responded to high inputs in 2017. When averaged across the three previous crops and two rotations, conventional corn showed an average 23 bushel/acre yield increase with high inputs; whereas organic corn showed a 27 bushel/acre increase. The experimental site received about 10 inches of precipitation from side-dressing (June 15) until the end of July, which probably resulted in considerable leaching of side dress liquid N, but much less of the slowly released organic N from plowed-down red clover. We believe that lack of available soil N in the recommended input treatment probably resulted in the yield response to high inputs in conventional corn. In organic corn, however, the lack of available soil N, especially when following soybean, as well as final plant densities of only 22,000-24,000 plants/acre probably resulted in the yield response to high inputs. Grain N% showed a cropping system x input treatment interaction (Table 2). Grain N% showed a consistent 0.06 to 0.12% grain %N increase in the high vs. recommended input treatments in both organic and conventional systems (even with the significant yield increases), except in the conventional system when following red clover (average 1.33 and 1.34% N, respectively). Critical grain N concentrations vary greatly according to growing conditions and are difficult to detect. Some studies have suggested that a grain N concentration of 1.31% N separates sufficiency from deficiency. Only the high input conventional treatment following soybean and the high input organic treatment following red clover, the highest yielding treatments, were clearly above the 1.31% grain N threshold, consistently in the 1.41 to 1.43% N range. Correlation analyses indicated highly significant correlations between grain yield and grain N% (r=0.68, n=88) as well as grain yield and plant densities at the V9 stage (r=0.46, Table 3). Grain yield and weed densities at the V14 stage had a weak negative correlation (r=0.20). Apparently available soil N and plant densities were the major drivers of corn yields in 2017, when excessively wet soil conditions persisted through the end of July. Organic corn is eligible for the organic premium this year so with similar or greater yields, organic compared with conventional corn would be more profitable in 2017. Costs, however, would be greater for organic corn, especially with high inputs, because of the 10x more expensive N fertilizer, associated with the cost of Kreher’s composted manure (many organic growers, however, use a far cheaper source of organic N than composted manure). Likewise, weed control costs in organic corn would be higher because of the five trips across the field for rotary hoeing and cultivation. In addition, seed costs for organic corn, although lower than conventional seed costs, would increase because of the apparent need for higher seeding rates to account for the 5,000 plant/acre plant loss incurred during rotary hoeing and cultivation operations. (We will increase our recommended seeding rate recommendation for organic corn to 35,000 kernels/acre in the 2019 Cornell Guide for Field Crops). Nevertheless, the organic premium will offset the additional costs for 2017 organic corn production.